(Click to enlarge) Jessica Henkel accepts the 2014 Watkins Award from Dr. Robert Gagosian. 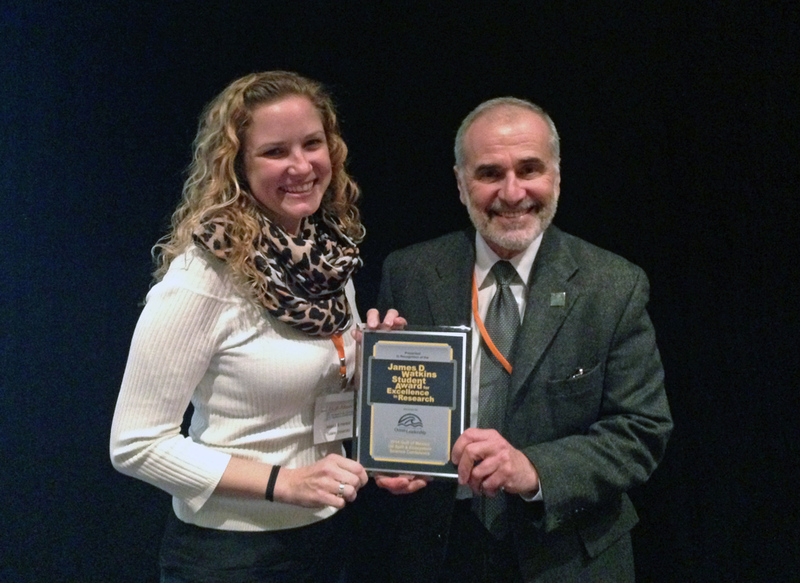 GoMRI congratulates Jessica Henkel, of Tulane University, winner of this year’s James D. Watkins Award for Excellence in Research for outstanding presentation at the 2014 Gulf of Mexico Oil Spill & Ecosystem Science Conference! The James D. Watkins Student Award for Excellence in Research strives to recognize outstanding research in order to cultivate the next generation of ocean scientists and encourage excitement for presenting their work. Jessica’s talk, entitled Impacts of the Deepwater Horizon Oil Spill on Shorebird Communities in the Northern Gulf of Mexico, embodied the Watkins Award evaluation criteria (scientific merit, research capability, design & style, and knowledge of presenter) and was referenced several times within its scientific session. The winner of the Watkins Award for Excellence in Research for outstanding poster will be announced soon!